Photo: Agriculture in the Central Mojave. Eastern Mojave Vegetation Agriculture in the Central Mojave. This photograph looks east from Harvard Hill across the Mojave River to the Cady Mountains. The large green circle is one of several alfalfa fields in this area. Ground water is pumped into huge sprinkler systems to irrigate the alfalfa. The combination of soil disturbance and declining water tables has destabilized the landscape resulting in increased sand movement and dust storms that have been blamed for fatal highway accidents. 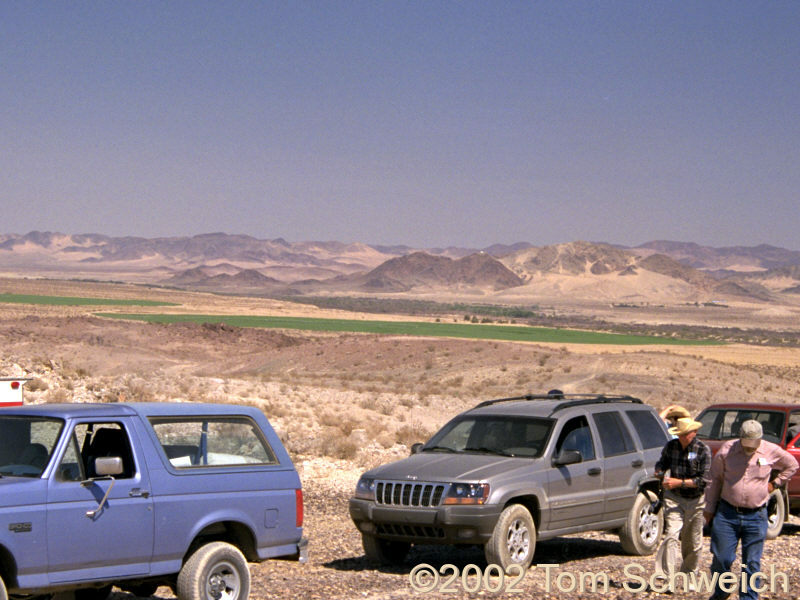 The cars and people are participating in the 2002 Desert Research Symposium field trip and are here in Harvard Hill to review marker beds in the Miocene Barstow Formation..
Field Notes: 20 Apr 2002. U. S. Interstate 15: 56798.